A confidential partnership between the Department of State, the Obama administration, the Silicon Valley Billionaires and a group named “The Alliance For An Affordable Internet” has been quietly exposed in a series of Bloomberg News articles I have followed from Feb 2011 to Feb 2013. After two years of looking and waiting, here is the very bad news of what our government has done behind the scenes. Most of the $307 billion went to and is going to Silicon Valley to build the “African Internet” in Nairobi, Kenya. Eric Schmidt, head of Google, seems to be leading the pack. He now calls Nairobi, “The Silicon Valley of Africa”. On Feb 1st 2013, when Hillary Clinton ended her Secretary of State job. Bloomberg’s headline said, “Hillary Clinton Helps Silicon Valley On Her Way Out The Door”. That’s it folks. What can we do about it? Pt. 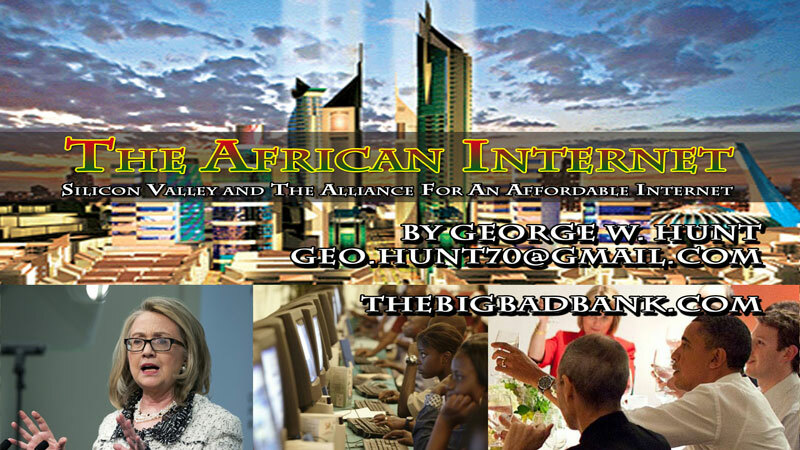 1 – The African Internet, Silicon Valley and “The Alliance For An Affordable Internet” – George Hunt presents his findings on what the governments 307 billion dollars in grants to the Silicon valley are going to. In this investigation he uncovers the results almost 2 years after the original grants were proposed and we learn that a lot of that money is going in to build an internet pipeline in Africa and bringing African people online. George asks the looming question of why would we want to invest 10 percent of the US budget into Africa.